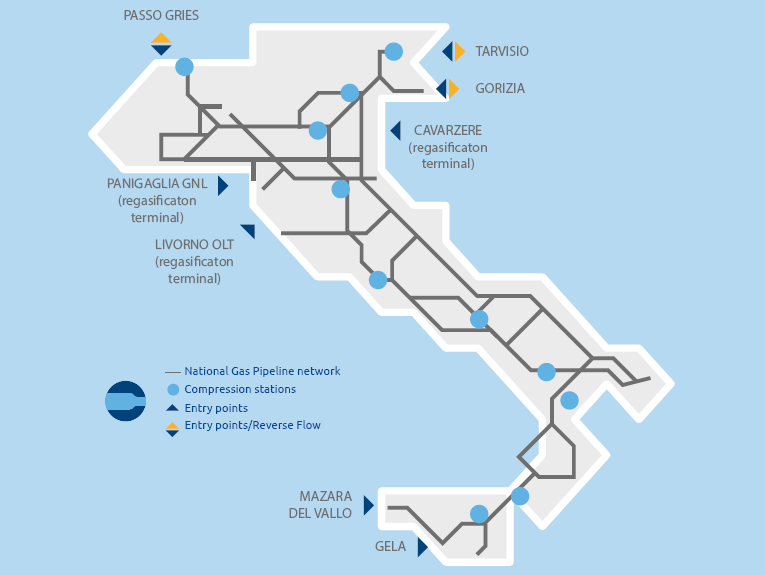 Snam is the leading Italian natural gas transportation and dispatching operator, and owns almost all of the transportation infrastructure in Italy, with 32,584 km of high- and medium-pressure gas pipelines (approximately 97% of the entire transportation system). Snam manages the gas pipeline network via 8 districts, 48 maintenance centres throughout Italy, 11 compression stations and a new dispatching unit that has been extensively renovated in terms of structure and technology. The gas coming from abroad is fed into the network at the seven entry points, corresponding to the interconnections with the import pipelines and LNG regasification terminals. Once it has been imported or regasified, the gas is transported to the local distribution networks, the regional network redelivery points or large end users such as thermoelectric power stations or manufacturing plants. Snam awards transportation capacity to applicant shippers. In this way, users acquire the right to feed or withdraw, on any day of the thermal year, a quantity of gas not exceeding the daily flow rate. The conditions for access to the service are contained in the Network Code. The shippers have the possibility to make sales and gas exchanges at a Virtual Trading Point (PSV) of the National Network, thanks to the dedicated IT platform. In 2017, the average transport capacity offered at entry points interconnected with foreign countries and with LNG terminals was 364.2 million cubic metres/day; in addition to this capacity, Snam has made transport capacities available at entry points interconnected with national producers for a total of 25.2 million cubic metres average/day and with the production of biomethane for a total of 0.1 million of cubic metres average/day. During the last 14 years, transport operators have grown steadily, going from 30 in 2003 to around 200 subjects in 2017 (between shippers and traders), with 128 customers (-6% compared to 2016). In 2017, 78 connection contracts were signed for the construction of new delivery/redelivery points (of which 13 were for biomethane injection) or the upgrading of existing points.